GEOGRAPHY The jungle carpet is found in the rainforest of the Atherton Tablelands of Australia.North Eastern part of the country.CARE: This species is now captive bred in large numbers.No jungles are imported because of the strict laws of Australia so the ones encountered in the trade are captive born.However this snake was once smuggled in to the states often in years past.The New Guinea carpet python resembles the jungle and is legally imported but these are not true jungles.They are a relatively small carpet adults reaching about 6' in length however some may exceed 8'.They should be given a moderatlely humid enclosure.Humidity around 60-70%.Humidity may be increased during shedding to make sure the skin comes off cleanly.They should also be given a fairly large water container for soaking.This species seems to love to climb and branches will definately be used by young and adult snakes.In fact you may wonder if your snake will ever venture to the ground!They are a fairly active snake but enclosures do not need to be overly large.Adults may be kept in a 3'x2' enclosure,however larger adults may require a 4' or even 6' enclosure.Hide boxes can be used and some specimens are a little skittish and scared of humans and will need their privacy,others could care less.The substrate can be bark mulch,cork bark,or newspaper however make sure enclosures with newspaper do not become overly dry because they may have trouble breathing and shedding.Carpet pythons in general may have problems with respiratory problems if temps or humidity is too low. JUNGLE X DIAMONDS Another popular snake the hybrid diamond python.These are sometimes crossed with the jungle and some can be extremely attractive.Adults are about the same size as the jungles.The diamond crosses in my experience require slightly higher humidity than the jungles but not wet conditions and natural sunlight may benifit the crosses.They may however be afflicted with the same problems as regular diamonds those being the bad respiratory problems and trembling when being held.No one is quite sure why diamonds in older years and if I did not mention it it usually affects older animals have these problems.Some I have talked with have had success giving juvenile diamond x animals extra vitamin d and sunlight.So a good calcium vitamin supplement should be used for hybrid adult and especially juvenile animals and sunlight may be of benifit also.I have lost crosses to this problem and they were vet checked and treated but nothing could save them so start early with your young animal on this vitamin.Do not overdue it though because vitamins can be toxic in larger doses. JUNGLESAnimals should be kept in the lower eighties and may be given a warmer spot of around 86-88'. BREEDING Jungle carpets may be ready to breed at 2 years old and only 4' however larger females are prefered.Light cycle should be dropped providing 8 hours of daylight.Daytime temps should be in the low 80s and night time temps may drop to 75 or 72.After about one month the adults should be introduced.cool temps should be maintained for 2 months however if a female has bred she should be given a basking spot.Females typically lay eggs 25 or 30 days after the pre lay shed.Average size of a clutch is between 7 and 15 eggs.However females laying 15 or 20 is not uncommon and some clutches may have as many as 25 or 30 eggs!Incubation takes between 55 and 60 days at 88'.The hatchlings do not resemble the adults in color.They are more drab looking lacking the high yellow.Typically they start to change colors between 6 and 12 months and are their most beautiful at about 2 years old.After that the bright yellow colors may fade away and older animals may be a drab mustard color.Genetics may play a part in this.Specimens may be nippy and shy for a while but most tame down nicely however some adults may stay a little nippy calming down after removal from the enclosure.The hatchlings may prefer to climb in branches rather than staying on the floor so they should be given branches to climb in.Some juveniles may prefer scented pinks with skink or gecko.Adults will never need over medium large rats.And they may be kept in plastic tubs for a couple of years until they will require a 3' enclosure. NOTES Some jungle carpet pythons can be absolutely stunning and can be a prize in any collection.However others may be average so seeing adult breeders are prefered before purchasing hatchlings.In particular look for older breeders that still have a nice yellow color not a 2 or 3 year old animal.The size of the jungle is quite nice being large enough to be impressive but small enough to be quite easy to keep and handle.Specimens are usually calm and can be handled alone without any problems.This is definately a 5 star animal however the drop in price makes them a poor breeding investment rather a snake to own to enjoy its beauty!The reason I mention that is because many ask if they are a good "investment". 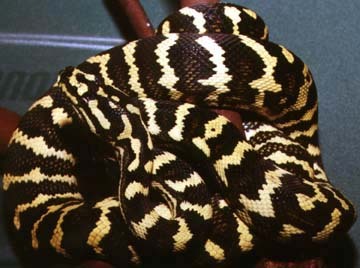 JUNGLE CARPET BY CASEY LAZIK, BELOW AN EXAMPLE OF JUNGLE X DIAMOND BY THE SNAKE DOCTOR.